The Natural Wonder of Sound." A cochlear implant is a small complex electronic device that is surgically placed under the skin behind the ear. It serves as a microphone, speech processor, transmitter and messenger to the brain. 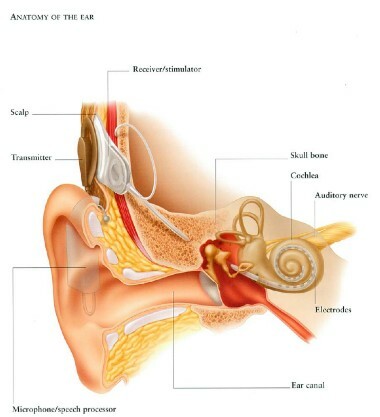 Normally, sound is transmitted along the ear canal to the cochlea, which converts soundwaves into electrical impulses. The impulses are then sent along the auditory nerve to the brain. If the cochlea is damaged, a cochlear implant (such as the one shown here, made by the Cochlear Corporation) can be used to bypass the usual hearing pathway. First, sound is picked up by a microphone, converted into electrical signals by a speech processor, and sent to a transmitter on the scalp. The transmitter relays the signals through the skin to a receiver-stimulator, implanted in the skull. The stimulator then relays the signal to electrodes, which stimulate the nerve fibers of the cochlea. Users may speak more clearly and understand others more easily without having to lip-read. Children can develop age appropriate speech and language, making communication easier at home and school. A whole new world is opened up from talking on the phone to listening to music. Hearing important sounds like sirens and doorbells may prevent serious accidents. Note: The degree of benefits is affected by factors including duration of hearing loss , age at implantation, mode of communication, status of the cochlea, and other conditions.